Quick and easy Nachos is a longtime family favorite and always on request ! 20 – 25 Minutes – start to serving ! So, while I have crafting on my brain lately, I was gently reminded that the other people in the house still needed to eat ! Oh, yeah … how could I forget !! This quick and easy Nacho recipe is my absolute favorite go-to meal when I need dinner on the table in a flash. All everyday ingredients, nothing strange or exotic, but it sure tastes great. From start to serving, this dish only takes 20 – 25 minutes and it is always a hit. 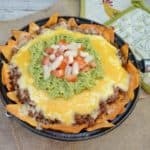 My family would request this easy Nachos dish frequently, and now and then I run out of proper Nachos, but I always have Doritos in the pantry. I actually prefer using Doritos to Nachos, even though it is not really Nachos any longer, or does it still count ? Anyway, up to you, whether you use Nachos or Doritos (the cheese flavored), your family will happily finish their dinner. Quick and easy Nachos is a longtime family favorite and always on request ! 20 - 25 Minutes - start to serving ! Yummmmm! 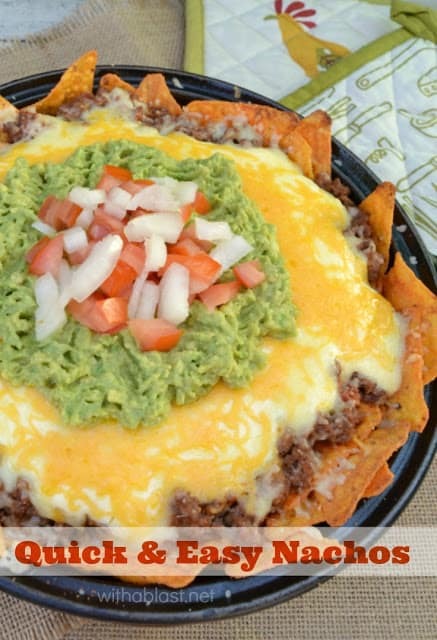 These look like nachos you'd order at a restaurant! I have never eaten nachos but this certainly looks delicious! Real Quick and easy recipe! Delicious! Best nachos I've ever made! How dare they expect food 😉 Those look like a good choice to keep them happy! We love nachos…I am pinning your recipe to my Mexi-meals board. Yummy! . . . is it time for lunch yet? This looks soooooo good! I never though about putting the sour cream under the cheese…I'll have to try this soon! Found you on Freaking Awesome Friday! I'm so hungry and this would hit the spot right about now!! Your Nachos look yummy! Thank you so much for sharing your delicious recipe with Full Plate Thursday. 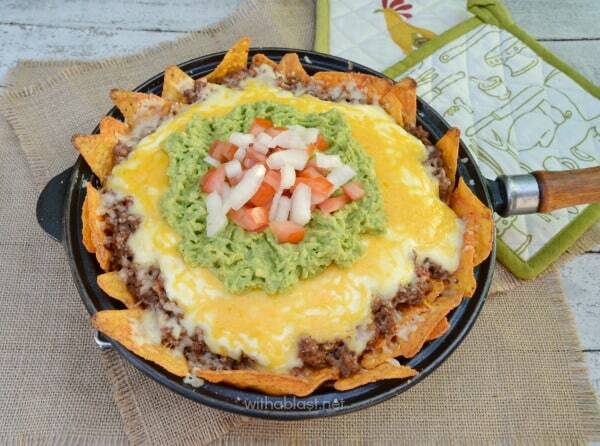 These nachos look SO yummy!!! Thanks for sharing & linking up to Thrifty Thursday! It's like 6am here and guess what I am craving? lol Visiting from The Mellywood Mansion. Have a great weekend! I love that there is Gouda in this! I love Nachos. 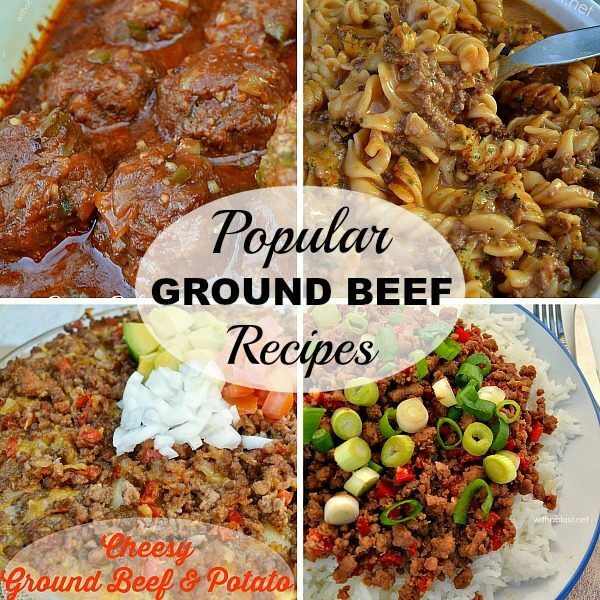 Looks like a recipe our readers would really go for. I would be honored to have you add us to your list of link parties. Our weekly Super Saturday Link Party goes live 8pm Fridays at MadeFromPinterest.net. We would love to have you join us. 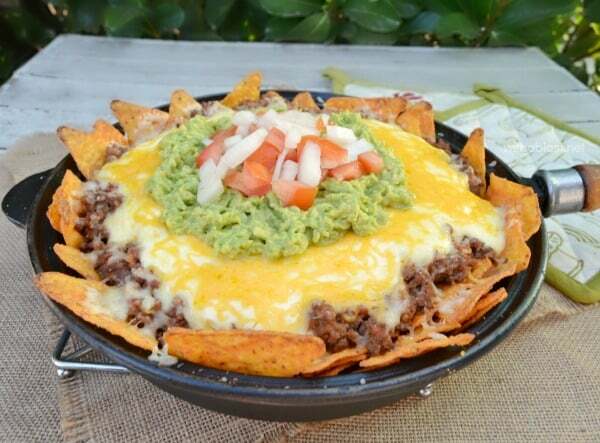 There is nothing better than a platter full of nachos! These looks delicious! The gouda cheese is a real twist. My family loves nachos and I wonder what they would think of the gouda. Thanks for sharing at What'd You Do This Weekend. HOLY 10 pounds! Looks delicious! 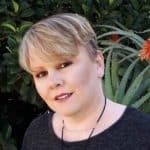 If you have any desserts you love, we'd love for you to come over to our newest link party over at The Inspiration Network: DELISH- a desserts only link party. Bring your desserts and let's party!! These look great…thanks for sharing! Just the way I like food – quick, easy, and Mexican! Thanks for the recipe. A dish that is after my heart!! Nachos are the best and I love the two cheese blend on this plate! !